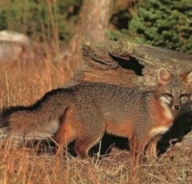 The grey fox can be found from Ontario, Canada, throughout the central and southwestern United States down to Venezuela. It also lives in the chaparral of California and Mexico. It prefers wooded and brushy areas of the southwestern, central and eastern United States where most of the rainfall is in the winter, while the summers are hot and dry. It is not found in the Rocky Mountains, the Great Plains or eastern central America. It disappeared from Canada in the late 17th century, but lately they have been found in southern Ontario, Manitoba and Quebec. They don't like agricultural areas like the red fox. Its den sites are made in rock formations, hollow logs and trees, burrows and brush piles. The dens are often lined with grass and leaves. The grey fox looks a lot like a small dog with a bushy tail. The fox's back is whitish-grey in color. The sides of its neck, the base of its tail, back and legs, and the underside of its tail are bright rusty-red. A black stripe runs along the top of its bushy tail, which ends in a black tip. Its muzzle is black and a black stripe goes from its eyes towards its neck. The grey fox is 21 to 30 inches long, and its tail is another 11 to 16 inches long. It stands about 15 inches at the shoulder. The adult grey Fox weighs 7 to 11 pounds. The grey fox has short legs that are very powerful. These legs are designed to give the fox tremendous ability to balance itself while it climbs. Strong, hooked claws allow them to pull themselves up tree trunks and branches. The color of its fur hides it from predators. The grey fox is the only member of the dog family that can climb trees. It will climb a tree to escape its enemies. It climbs by grabbing the trunk with its forepaws and scrambling up with the long claws on its hind feet. It can make its way through the tree tops by jumping from branch to branch or shimmying down backwards. It will also sit in the trees and ambush prey. It is not a fast runner, but can reach speeds of 42 mph. for short distances. Grey foxes are crepuscular animals meaning that they can be out at any time during the day although they tend to hunt at night. They are very territorial and mark their boundaries with urine. Females reach maturity at one year and breed from February to March. The father, or dog fox, stays with the female and he is responsible for bringing back the food to the den. Her responsibility is to watch over the pups, to groom them, to teach them the ways of the grey fox. Usually 3 to 4 pups are born after 50 to 55 days. They are dark brown and blind at birth and weigh 3.5 oz. They open their eyes after 10 days. The mother stops nursing the pups after 10 weeks. During this time the father provides the whole family with food. The family begins to disperse during the fall. Grey foxes are usually solitary during the winter. The grey fox lives for 6 years in the wild and 12 years in captivity. Grey foxes do not migrate but they do travel many miles during their lifetime. The grey fox is a solitary hunter, and eats a lot of different things such as berries, nuts, birds, insects, rabbits and other rodents. The grey fox is an omnivore. If it has more food than it can eat, the fox will bury it and go back later. It will mark the spot with urine so that it can find it when it gets hungry. In the arid regions of the chaparral it will eat more insects and plants than foxes living farther east. The grey fox has few predators besides man. Hawks, eagles, owls, bobcats and dogs will kill and eat the pups. Its ability to climb trees allows it to eat food not eaten by the red fox. By climbing into the tops of a tree, the grey fox often ambushes its prey. The grey fox is plentiful in the wild. It often helps the farmer by eating rodents. "No one should shoot or trap a fox; these animals should be protected. The farmers should protect their chickens with a fence and realize they have to share their crops with the other wonderful creatures we share this earth with. Regards, Mary". I agree completely. We should all become more sensitive to the creatures we share our world with. To say that the grey fox is plentiful in the wild does not mean that it will be there forever if we don't take actions to make sure of that.